Crossover for the 2019 General Assembly session was midnight on Feb. 5, marking an important deadline for lawmakers to decide which bills will go forward and possibly become. To become a law, a bill has to pass both legislative chambers – the House of Delegates and the Senate. By Crossover Day, a bill needs to pass through the chamber where it originated before it can “cross over” to the other. The General Assembly’s 45-day legislative session will end Feb. 23. Between now and then, lawmakers will decide which bills deserve to be sent to Gov. Ralph Northam for his signature or veto. With more than 3,000 bills introduced every legislative session, these final days are critical in advocating for policies that protect civil liberties and against policies that infringe on your rights. It’s important to contact your legislator to weigh in on these important decisions. 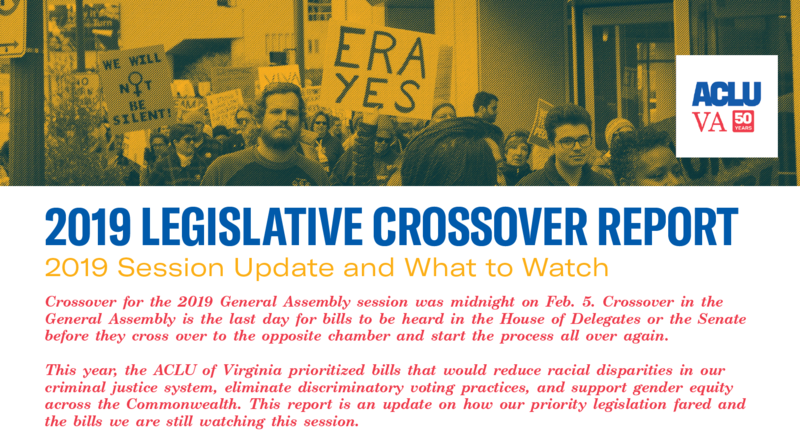 This year, the ACLU of Virginia prioritized bills that would reduce racial disparities in our criminal justice system, eliminate discriminatory voting practices, and support gender equity across the Commonwealth. We worked with various grassroots organizations, community members and lawmakers to push forward these initiatives. Our 2019 Crossover Report details the status of our legislative priorities as well as bills we’re tracking.